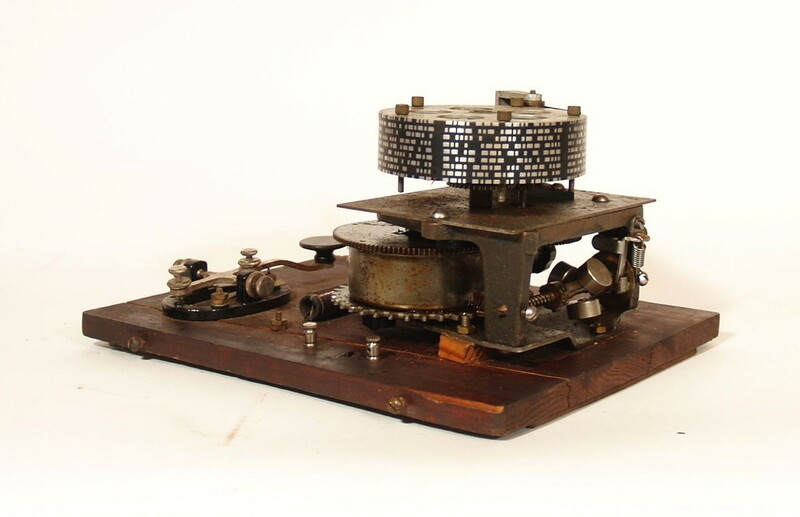 The Omnigraphs are machines that were used to teach people how to read Morse Code. Patented in 1903 and 1904 by Charles Chinnock, and sold through The Omnigraph Company in New York, they are strange looking contraptions that use metal disks that are notched along the edge to create "bumps" that resemble Morse Code characters. 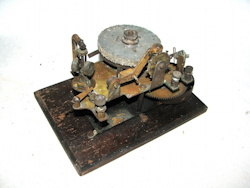 The first Ominigraph model was also the most simple. 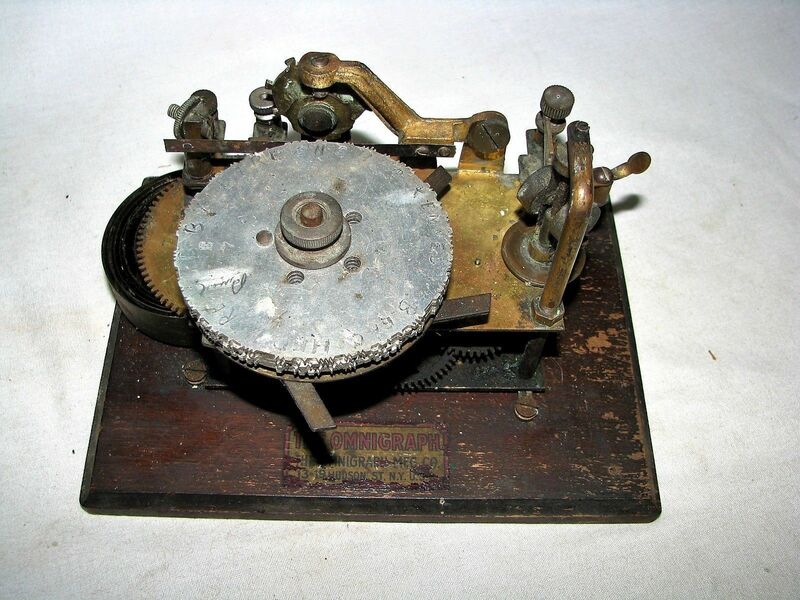 It consisted of a single notched metal disc that was manually turned with a small cranking handle. 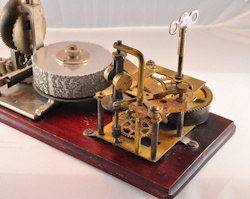 The disc was mounted on a round wooden base with 2 binding posts that were connected to a telegraph sounder and battery. 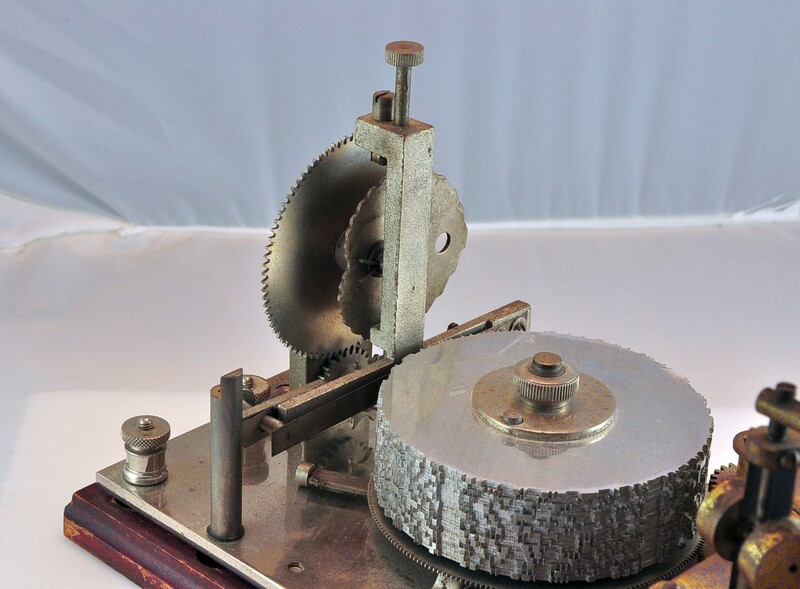 As the handle was turned, a contact strip moved along the notched wheel. 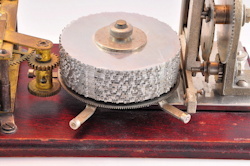 The "bumps" on the edge of the notched wheel caused this contact strip to touch a second contact mounted on a fixed post. 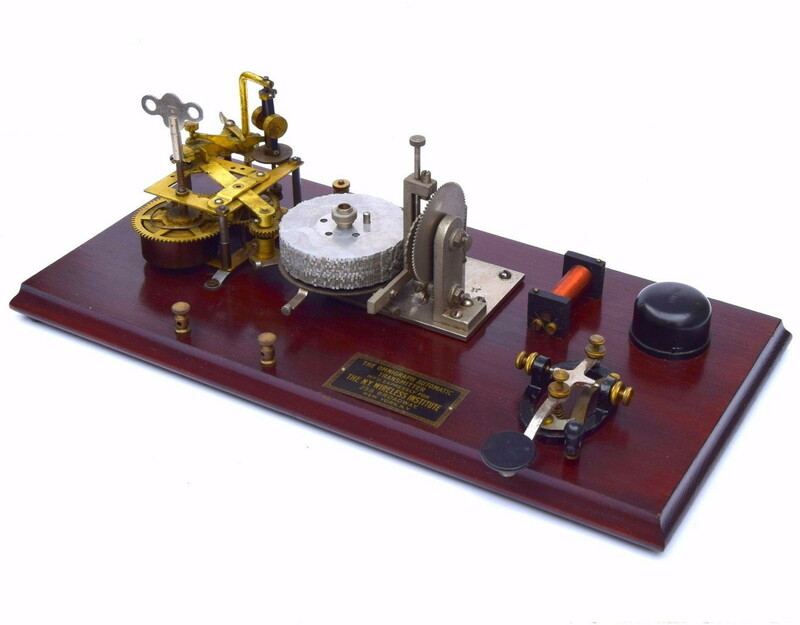 This completed the circuit and the sounder produced an audible sound corresponding to the Morse Code characters along the edge of the disc. The round base model was only made for a short time. 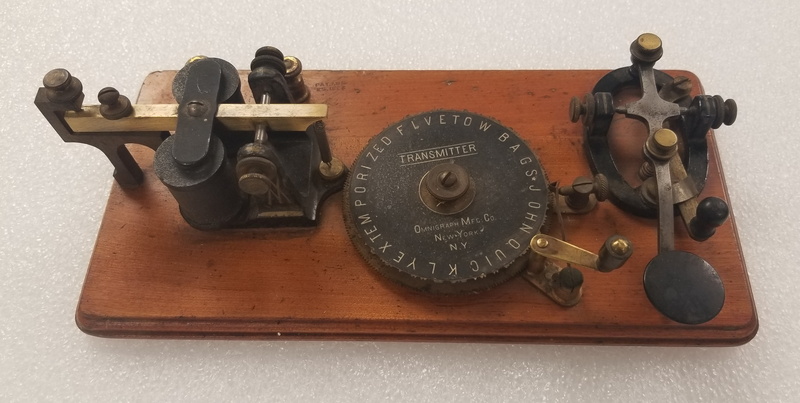 Soon after, the design was changed so that the disc was mounted on a larger rectangular board with a key and sounder attached. This was actually the design represented in the first Omnigraph patent. 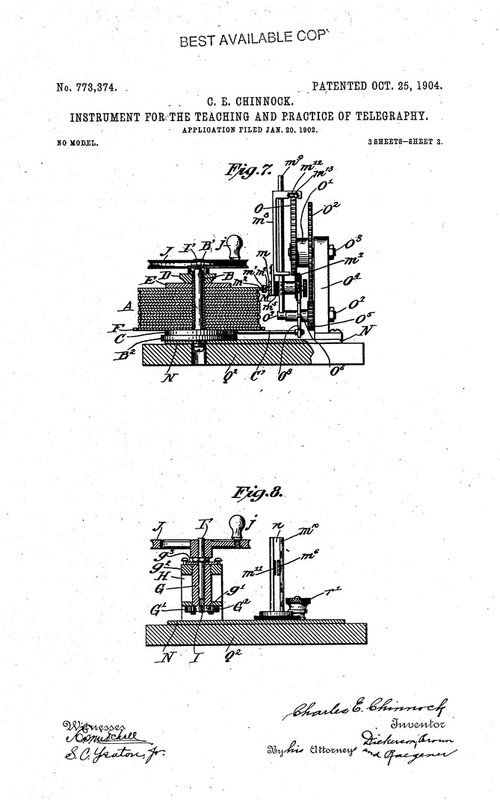 The small cranking handle often fell off the unit and was lost. 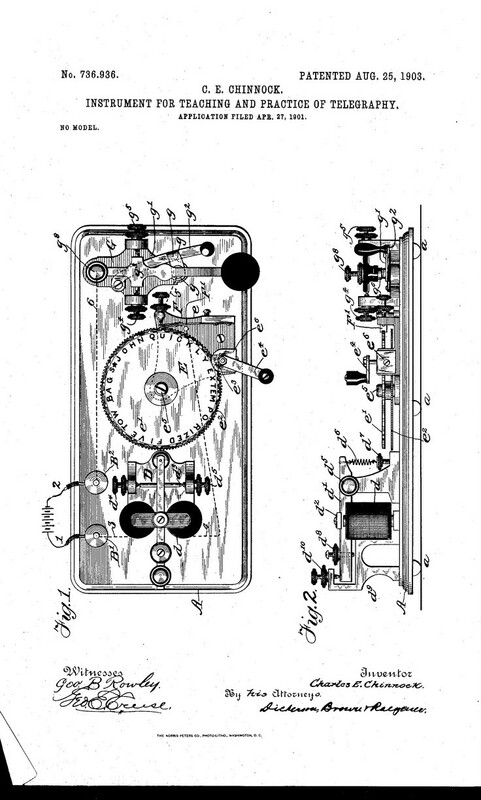 Click here to see the first Omnigraph patent from 1903. 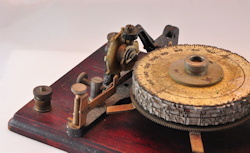 The first Omnigraph models were really nothing more than a novelty, because they only had a single code disc which was quickly memorized by the operator. 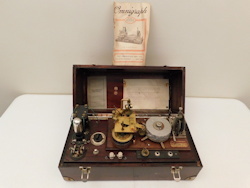 This limitation let to the development of the next Omnigraph, which was sold as The Omnigraph #2. 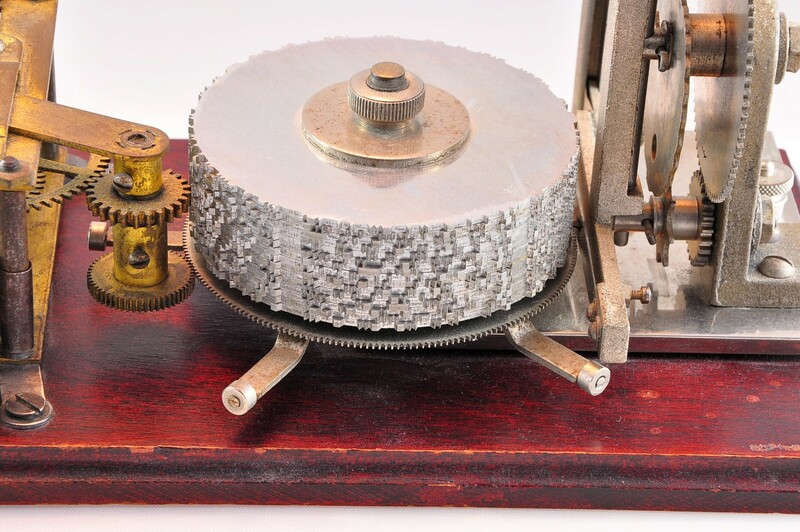 The Omnigraph #2 had not one, but a stack of 15 notched code wheels which could be changed out with other discs. Both American and International Morse discs were available. Instead of a manual cranking arm to turn the discs, the new Omnigraph used a spring-wound motor to rotate the discs. 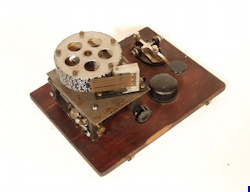 At the other end was a moving contact strip that could move up or down on the stack of disks. 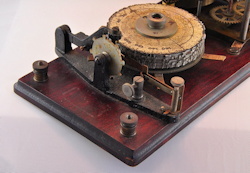 The position of this contact strip was controlled by a heart-shaped notched cam wheel. 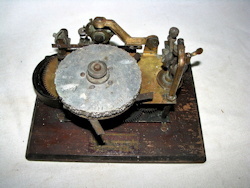 Under the stack of discs were several metal arms that extended outward from the discs. 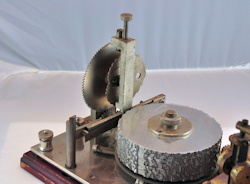 As the discs rotated, the arms would periodically cause the notched cam wheel to rotate a small amount, which caused the contact strip to move to a different disc. 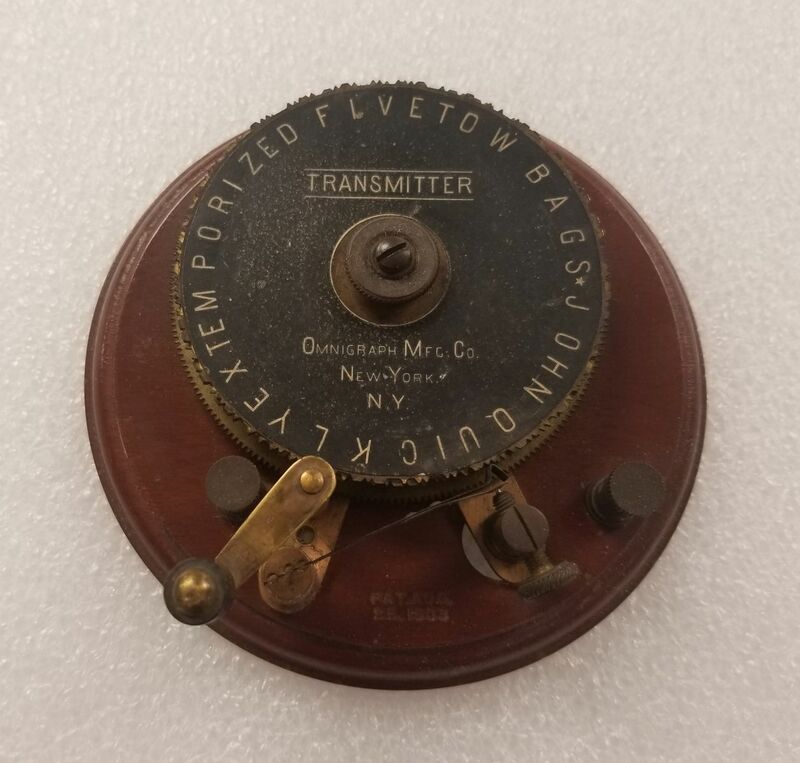 This would essentially produce a semi-random movement of the contact strip along the disc stack, which made it extremely difficult to memorize the sequence of Morse Code generated by the Omnigraph ! 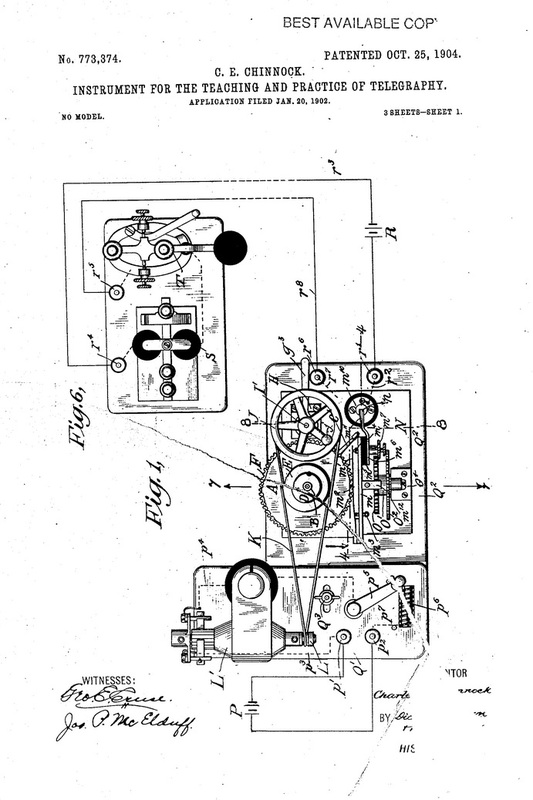 The second Omnigraph patent shows a multiple-disk device that was powered by an electric motor rather than a spring-wound motor. The only Omnigraph that I have seen using an electric motor was actually a version of the single-disc device. 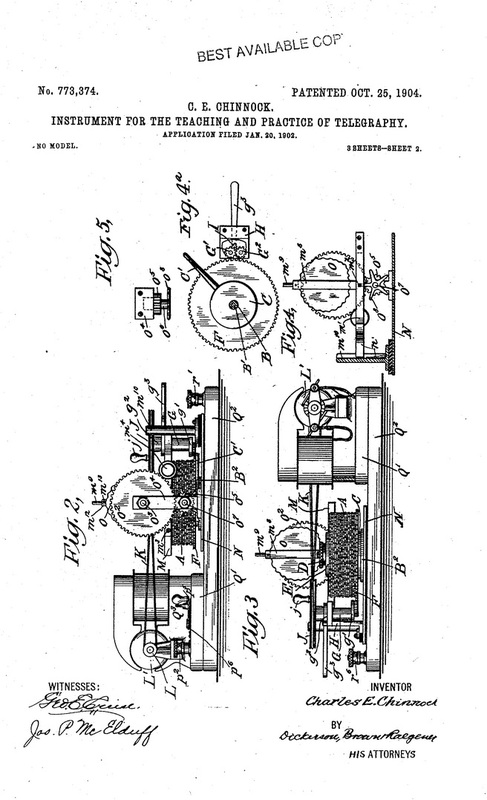 To see the second Omnigraph patent, click on the following photos: PHOTO1, PHOTO2, PHOTO3. In the 1920's, Omnigraph introduced another model called the Omnigraph Junior, which used 5 discs. 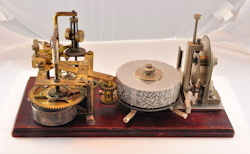 It used the same spring-wound motor as the 15-disc model, but the moving contact and cam mechanism were modified to account for the shorter stack of discs. 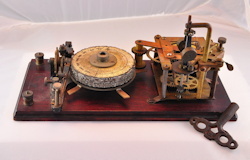 Another version of the 5-disc Omnigraph exists that is built on a smaller base with the motor and cam mechanism integrated into the same unit. 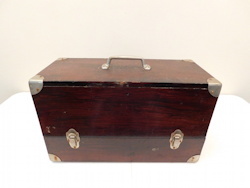 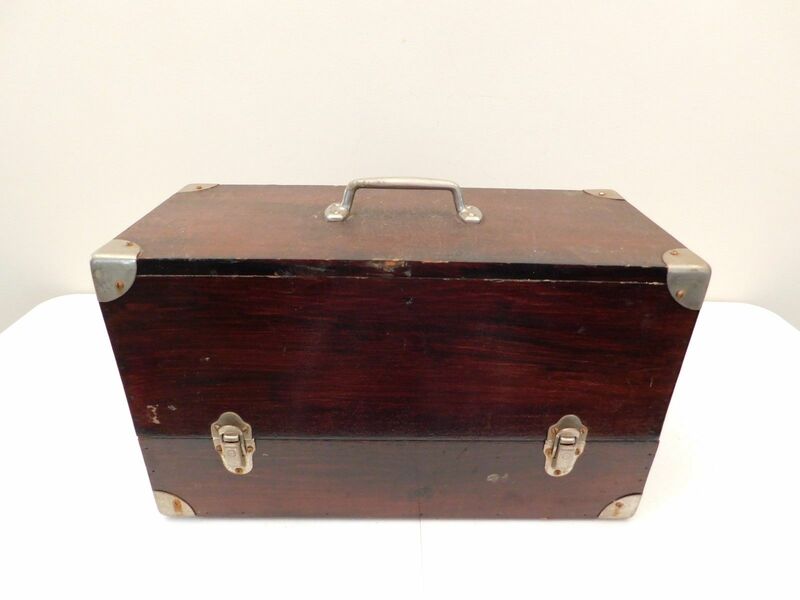 A big part of the Omnigraph Company's business was selling instruments to various telegraph training schools around the country. 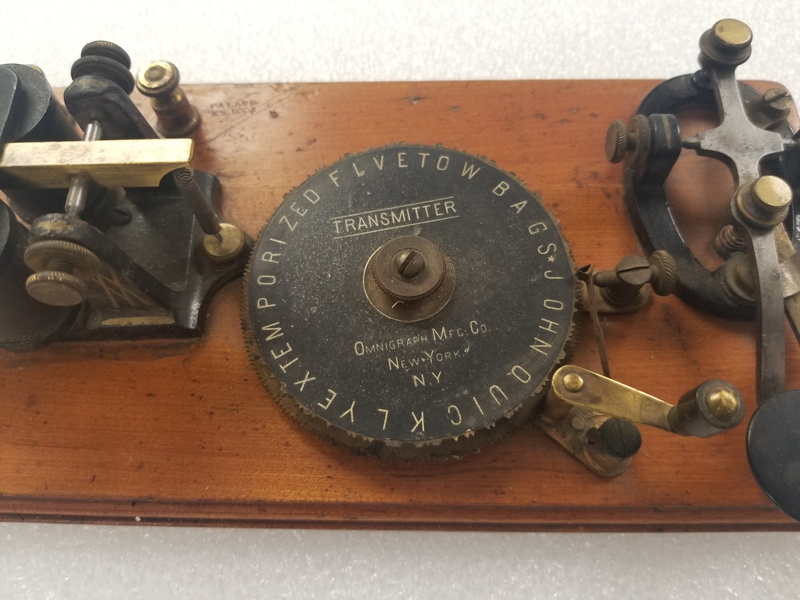 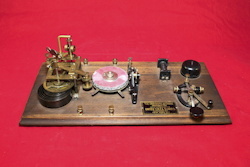 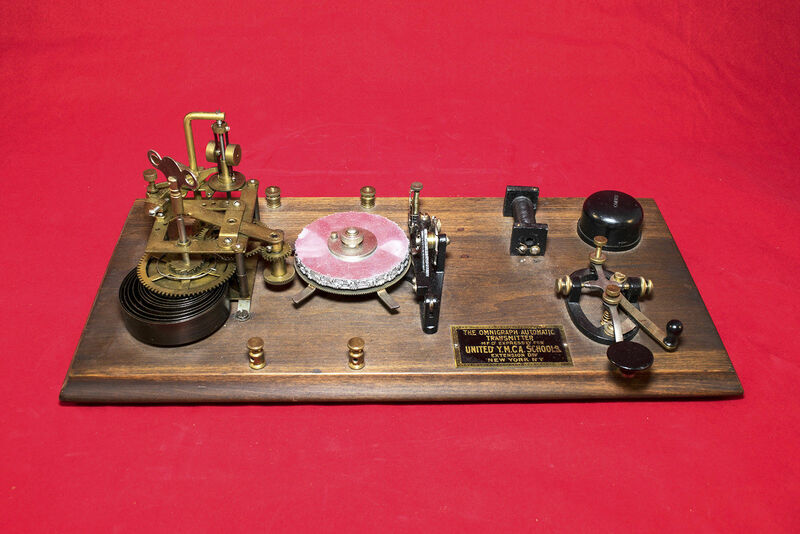 This led to the introduction of customized models, some of which included a built-in telegraph key or the addition of a buzzer to hear the code so that a separate sounder was not required. 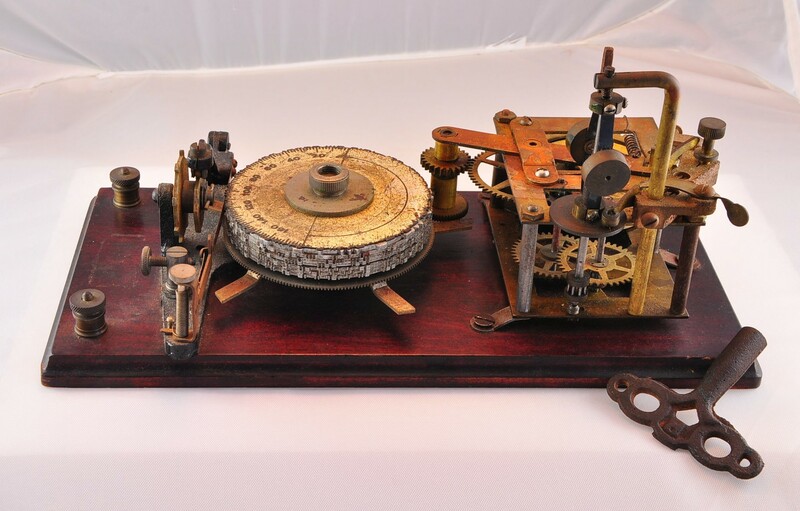 Another Omnigraph Combo set consisting of an Omnigraph #2, buzzer, audio oscillator, and 2 headphone jacks.